Roscommon University Hospital is hosting an exhibition of work by contemporary visual artist Rosemarie Langtry until 24 May 2019. Rosemarie Langtry’s work is spontaneous and inspired by nature and its environs. 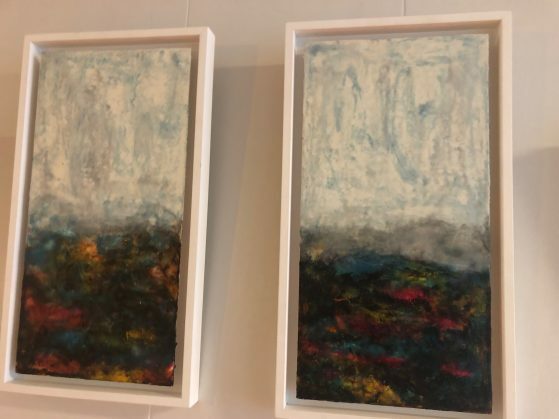 Using paint and layers of encaustic, she creates work that encapsulates the atmosphere and emotion of the Irish landscape. Rosemarie is based in Ballinahown, Athlone, Co. Westmeath. Since Roscommon University Hospital’s inaugural exhibition in August 2016 (Head in the Hedgerow by artist Hugh Barr), the hospital has hosted a series of exhibitions, with an emphasis on work by Roscommon-based artists including Mote Park artists, Anne Rigney, Frances Crowe, Dee McKiernan, Sharon Joyce, Sue Byrt Foxe and Treacie Linnane-Faulkner.